Last month, my husband and I went to a friend’s home for dinner. It seemed to be a nice night so we ate outside on the open patio. Shortly after dinner was served, we felt a few raindrops begin to fall. It wasn’t a lot of rain, but enough for me to consider picking up my dish and going inside, but without saying a word, the host got up and retracted an awning from the house, providing just enough protection from the rain. 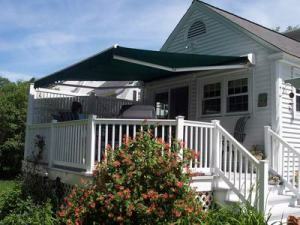 Awnings are great outdoor living features for residential and commercial properties alike because of their versatility. Some homeowners want a space that provides for both sun and shade, but they have limited square footage to work with. Or, an owner may want a covered patio but doesn’t have the budget for the roof structure. In both of these cases, awnings would be an option. Awnings are installed to the home’s façade and can be built in a variety of sizes to fit the outdoor living space. They retract from the home to create a strong canopy above a deck or patio and are available in both manual or electric. At Archadeck Outdoor Living, we always design outdoor living spaces that work together; no component looks like an afterthought. With all the fabric and color choices you can choose for your awning, it is sure to complement your home façade’s color as well as the color of your outdoor furniture and accessories. The benefits of an awning are plenty. The most obvious benefit is that it creates both an open and covered outdoor living space that can be changed as needed, but did you know it can impact the inside of your home? Awnings were incredibly popular on both windows and doors as well as outdoor living spaces 40 to 50 years ago because of how they impacted the home’s temperature. Awnings can reduce the heat making it inside of the house, reducing cooling costs. Our trained Archadeck Outdoor Living designers can help you decide on which awning configuration will fit your outdoor living needs. Please reach out to your local Archadeck office with any questions you may have. It’s spring which means it is time to move it outdoors and enjoy the nice weather. Creating beautiful outdoor living spaces that you want to spend time in is one way to ensure that you aren’t cooped up inside all the time. 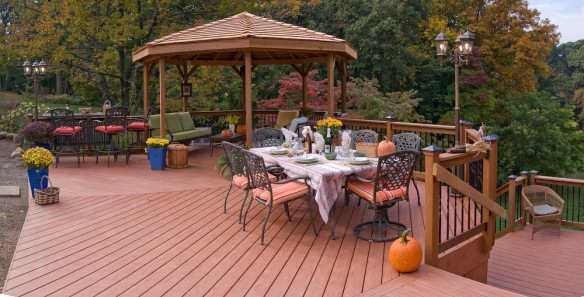 If your existing deck or patio isn’t as inviting as it should be, it doesn’t mean you need to completely replace it. Instead, look for ways to update and enhance it. 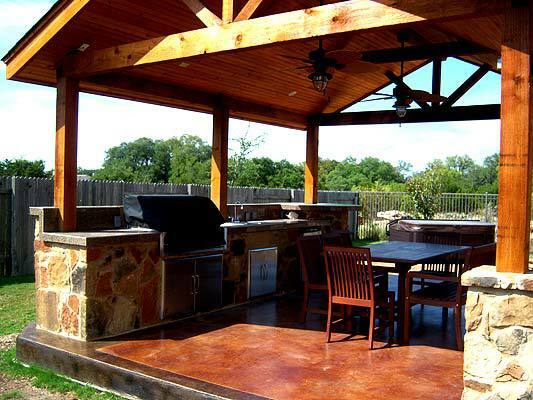 Here are some ideas from the outdoor living experts at Archadeck. Seating/furniture options. In one of my first homes, I had a great little patio, but I barely used it. While I had furniture outside, it wasn’t comfortable furniture that I wanted to spend a lot of time on. Looking back, had I updated my seating options, I would have spent more time outdoors. If you aren’t sure of spacing, have a deck and patio builder visit your property and discuss built-in seating with benches or retaining walls. This is a great way to increase the amount of seating you have. Shade. Having shaded areas in your outdoor living areas creates a space for you and guests to escape the hot sun if needed. Shade options are varied and include awnings, arbors, trellises and pergolas, all of which can be installed on an existing space. 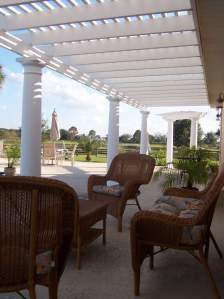 Pergolas are one of the most popular shade options. The size, shape and design and can be tailored for you, your tastes and your budget. Color. Color adds life into any living area whether indoors or outdoors. 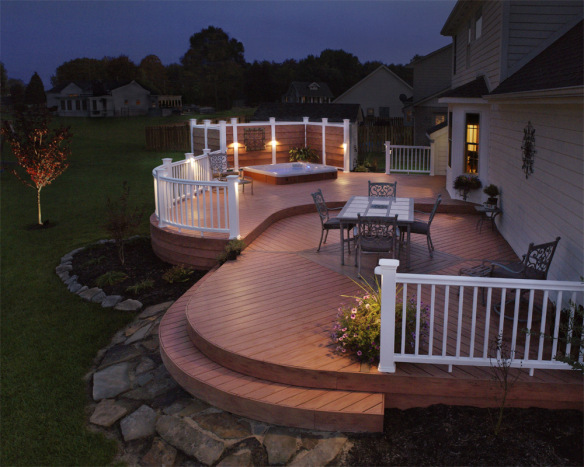 Take a look at this deck, doesn’t its colors make you want to spend time on it? Colors can be added in a lot of ways. If you have existing furniture, consider purchasing some new decorative outdoor pillows to liven up the space. 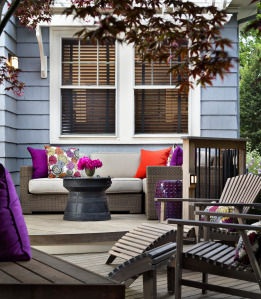 Or, add an outdoor rug, not only will it add color, but it will also help define your space. Adding planters with flowers and greenery to a deck or patio is also a great way to add some color, and they’re easy to change every season! Outdoor Lighting. Eventually your outdoor living spaces will get too dark for you to enjoy them when the sun goes down, unless you have outdoor lighting. Many of our Archadeck Outdoor Living locations install deck lights on their projects to make sure it can be enjoyed all day and night. Lighting will keep you outside and provide sure-footing as you move around your outdoor living space. If you are in need a more extensive lighting system, take a look at our sister company, Outdoor Lighting Perspectives. 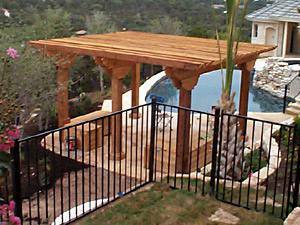 As always, Archadeck Outdoor Living is here to help you enhance your outdoor living spaces. Please reach out to any of our locations to learn more. I’m one of those people that is constantly changing, updating and tweaking my home. One space never stays the same for too long. It may be a small change like switching out pictures, or something larger like a new paint color or new furniture. In 2013, my husband and I have decided to be put some extra time and effort into our outdoor spaces. Because of their versatility and design options, one thing we are considering is adding a pergola to our existing outdoor living spaces. Pergolas are a great add-on to an outdoor living space. The finishes can match the structures that are already there. At Archadeck Outdoor Living, our offices design custom pergolas that enhance a space without it looking like an afterthought (even though it may be). My husband and I are thinking about a pergola to define our space. Our outdoor living area has a few different components and we are looking to make one part a little cozier. Pergolas are a great way to define a space as a separate area. Much like a porch (without the cost of a porch), a pergola frames out a section of the property. For us, we are looking for a cozy place to sit, read or have a drink. Look at this curved pergola for example. Although it is part of a larger structure, this is clearly a separate area. I’ve seen pictures of pergolas that are built over living and dining areas as well as outdoor kitchens. One of my favorite aspects of pergolas is that they do provide some shade while still allowing for sun as well. For the most part, I enjoy the sun, but there are times that I want a reprieve but don’t necessarily want to go inside. 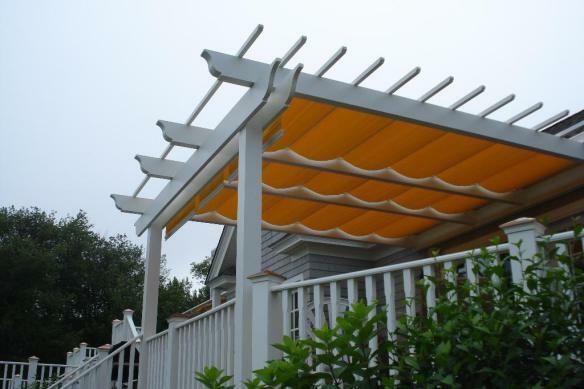 Some homeowners that want more shade also purchase pergola covers to block more of the sun. If you would like to learn more about pergolas and how they can enhance your outdoor space, please contact your local Archadeck office. One of the many benefits of adding an outdoor living structure to your property is that it increases the amount of livable space to your home. Outdoor rooms are becoming increasingly popular and are often used in multiples ways: a living room complete with couches, dining areas, outdoor kitchens, etc. The possibilities are endless when it comes to outdoor living spaces. 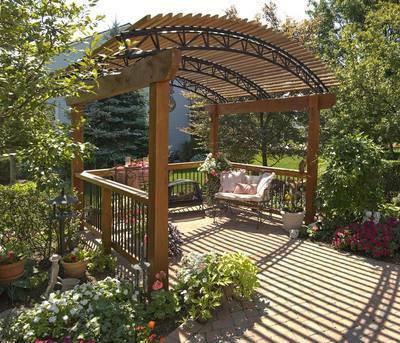 You can define different spaces of your outdoor structures in numerous ways, but one of our favorites is the pergola. 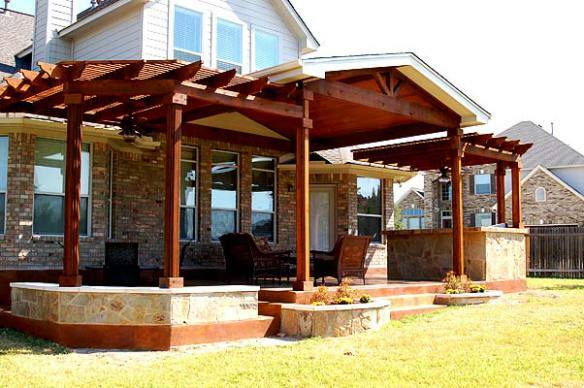 Seen here to the left, a pergola is shade structure that can be added to new or existing projects. Pergolas make a dramatic addition to any outdoor living area, creating the feel of a true room at the fraction of the cost of a sunroom or screened porch. 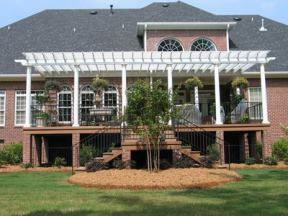 Pergola designs vary in size, shape and finish. A fan or triangle pergola may work better for your backyard than the more commonly used square or rectangle pergola. At Archadeck, we work with our clients to not only make sure their new pergola complements their home seamlessly but also that it works well with how they are going to use their space. If the space is going to be used for dining, do you need to include an overhead light? Do you need a fan to combat the summer heat? No problem, these are both easily incorporated to make your space work for you. Some Archadeck clients are opting to include awnings or louvered roofs to their pergolas for increased shade and definition. A louvered roof gives the homeowner the ability to let sun stream into the space or close it off for a more porch-like feel if wanted. Pergola with awningWith numerous options to consider, pergolas offer a lot of versatility that other structures don’t. If you’re interested in learning how a pergola or other structure can transform your yard, visit Archadeck.com for inspiration or contact your local Archadeck office. Sometimes it is the small things in your outdoor oasis that make the biggest statement. Take for example the pergola. Pergolas give you the capability of turning an outdoor space into an outdoor room for very little cost. 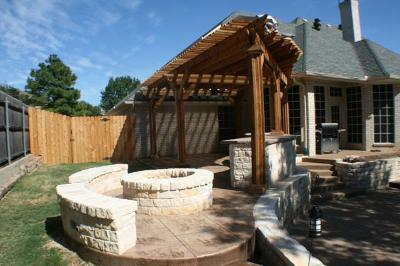 The pergola is among the fastest growing elements in backyard building. In addition to being able to provide a small intimate environment, pergolas provide loads of ambiance to your outdoor living area and landscape. Gone forever are the days of two posts with a board across the top. Today’s pergolas come in a myriad of shapes, sizes, materials. Today’s pergolas often have all the electrical accoutrements that are available in outdoor areas such as patios and porches. These accoutrements include speakers, lighting, fans and much more. Remember the pergola of the past that served as a decorative feature at the end of the pool? Pergolas today are used as hot tub covers, swing covers, garden area covers and patio covers. 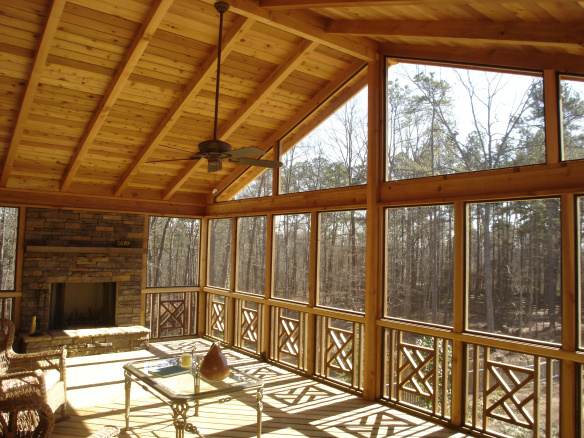 Pergolas can be attached to other structures such as patio covers and even screen porches. On average we see a 50/50 split of stand alone pergolas versus attached. Modern pergolas are being built nowadays to promote the feeling of a room, and a vast majority of them have lighting so it can be used in the evening as well as the daytime. In order for the pergola to fully function like an outdoor room you want to be able to provide shade as well as protection from the elements. Companion products are the answer and continue to transform your yard by dressing up your pergola and giving it either more sun protection, more wind protection, or both. These are things like shade fabric that is built into the roof of the pergola, curtains made of weather resistant plastic, and drop down weighted blinds to add more shade or wind protection on one side and even awnings. Once you put an awning inside the pergola, you get protection from the wind, rain and a place to provide much-needed shade which is still much less expensive than building a room. The construction of the pergola itself can be made more conducive to providing protection from the elements by the space variance between the cross beams located atop the pergola as well. The closer the beams are set, the more protection your pergola will offer. Popular materials for pergolas include unique materials, and material combinations. We are getting more requests for the beautiful rustic beauty of cedar, and redwood. We also use combinations of wood, PVC and even fiberglass columns. Most of the fancy rafter detailing which is hot right now comes from using wood because PVC and other synthetics don’t lend themselves to ornate detailing. 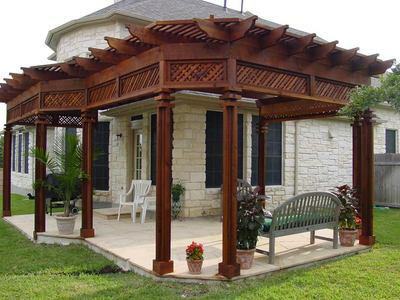 One of the unique facets of the pergola’s design is that there are no set standards so your pergola can really become a creative piece that you can add your own personal touches and character into. From shape, size, function, location and materials the world is your oyster. Contact Archadeck to design and build the pergola of your wildest dreams. When it comes to the design and functionality possibilities of the pergola, the choices are endless! You can find the Archadeck location nearest you by visiting our locations list located on our website. If you are still yearning for examples of the pergolas beauty and uses, visit our pergola and trellis gallery located on our website. Imagine having that one spot in your landscape that you can retreat when the day has been long and you need to renew yourself. Imagine an area that offers shelter from the elements, the wind, and the sun, and a place that offers shelter from the storms of a stressful day. Having a special spot of your own is easy with a patio cover from Archadeck. 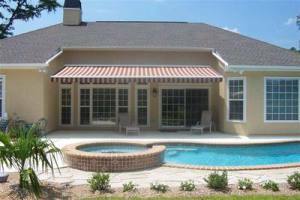 A covered patio, also referred to as a patio cover can transport you to a place of relaxation and refreshment. Patio covers are also a good way to show off the beauty of your home and landscape, by introducing elements to compliment both. Patio covers can be constructed with a mixed medium of materials that include natural stone, tile, hardscape materials such as pavers, composite and PVC materials, hardwoods, brick and concrete. Planning a new patio cover by Archadeck can turn the blank canvas of your existing backyard and transform it into a masterpiece with beauty and quality that will make your structure a feast for the eyes as well as the senses. At Archadeck we keep receiving more and more requests for patio covers. Many patio covers you see at the “do it yourself” big box stores are aluminum and lack the quality or beauty that Archadeck is renowned for. Now that being said, Archadeck patio covers not only talk the talk, in terms of aesthetic appeal, but they walk the walk as well with functionality, by broadening the spectrum of uses for your outdoor space. 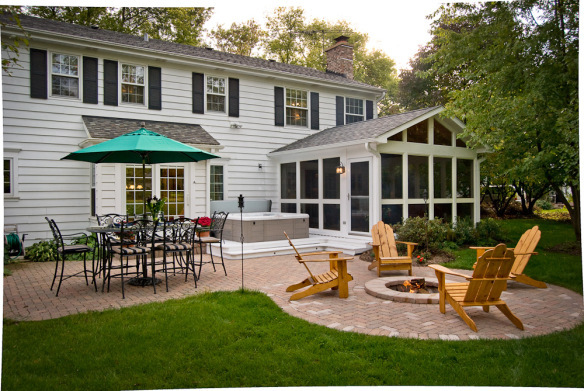 Patios in their own rite, are still a stunning and useful way to add livable outdoor space to any home or landscape. Patios can be used in conjunction with other outdoor structures such as decks, pergolas and much more. Is your patio able to be used on hot days when the sun is beaming down on you? Are you forced off the patio and indoors whenever the clouds thicken and the sky threatens rain? If you answered yes to either of these questions, then maybe a patio cover is an ideal way to get more hours of enjoyment out of your patio. Maybe you are “on the fence” as to build a patio that is covered or uncovered. 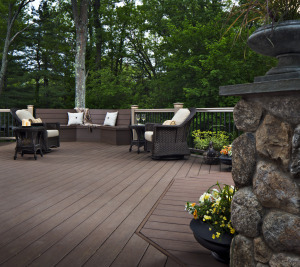 Archadeck wants to make your patio decision an easy one, with your comfort and lifestyle in mind. Archadeck of Fort Worth and Archadeck of Austin are both heavy hitters when it comes to building patios, covered and uncovered. Here are some photos of both locations stunning work to serve as an inspiration when deciding what path to choose for your new patio. Archadeck can take your existing patio and add a cover to create an outdoor room great for entertaining, or just reading a good book. With a patio cover you can enjoy the beauty of a summer rain while having a glass of your favorite beverage without the worry of getting wet. How many living rooms can offer you that kind of versatility? This patio cover by Archadeck of Austin serves as a triple threat with the clever and unique use of twin pergolas encompassing the central patio cover. This detached patio cover by Archadeck of Austin has natural rustic detailing and includes a fully functioning outdoor kitchen and dining area, perfect for entertaining, or a simple dinner date for two. 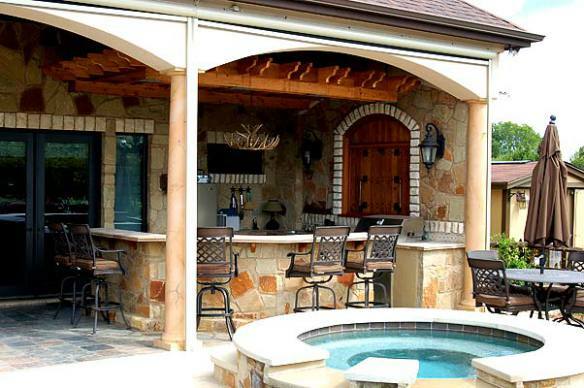 This patio cover by Archadeck of Austin has all the comforts of home, enjoyable outdoors. 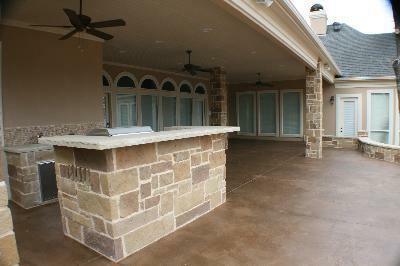 A great place to watch the summer rain or maybe the football game on your TV which is mounted in your patio cover. 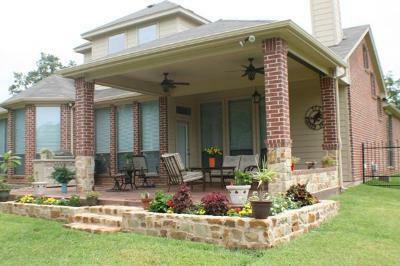 Another view of this patio cover by Archadeck of Austin shows just how much versatility this space offers. An outdoor bar and gully functioning outdoor kitchen are built right into the structure which showcases the beautiful spa area as well. Archadeck is America’s premier builder of outdoor structures such as these. Imagine a patio that becomes an extension of not only your living space, but an extension of your personality and tastes as well. From dining and seating areas, to outdoor kitchens and ceiling fans, Archadeck can plan, design and build a" patio cover":https://www.archadeck.com/design-ideas/patios-hardscapes/ that will leave you breathless. In this market, it can seem impossible to sell your house. There are so many home improvement projects you can do to raise your home value, but which ones help the most? The last thing you need to do at this point is waste your time on projects that only garner a small amount of home value. Remodeling Magazine has been conducting annual surveys of the most cost-effective home improvements since 1987. In 2007, the winner for a mid-range home was a wooden deck. Homeowners who had a 16 by 20 foot pressure treated deck installed recouped an average of 85.4 percent of cost of the project. 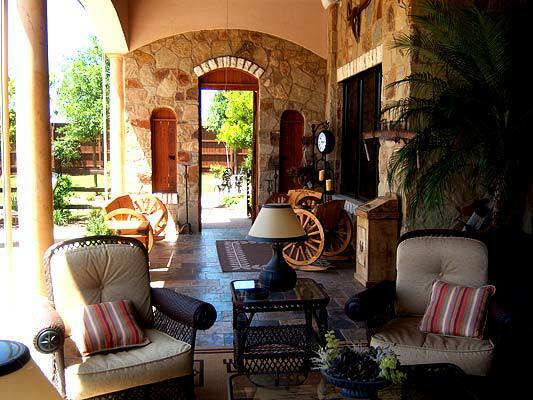 Similarly, patios, porches, and other outdoor areas have a high return on investment, as well. To explore these options and raise your home value, take a look at the Archadeck website. Archadeck’s brand new website officially launched this weekend with a different look and more information. 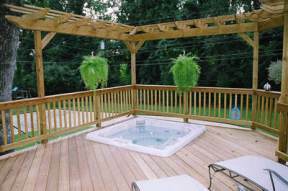 There are slideshows of pictures for decks, sunrooms, porches, and more, along with descriptions of services and locations. You can even follow Archadeck on Facebook now, using a link on the website. Enter your zip code to find the closest location to you or follow the link to start your own Archadeck franchise-it’s that easy. When it comes to updating your backyard, you may think of just one project at a time. A porch OR a patio. A gazebo OR a deck. So how can you combine more than one of these elements without overdoing it? Check out this project to see how multiple outdoor areas can be combined to give a cozy and relaxing feel to your backyard. The project features a screened porch, a stone patio, and a fire pit, fully decorated with an outdoor dining area and spa. What Is IPE And Is It Right For Your Deck? You may have heard of decks made with IPE. 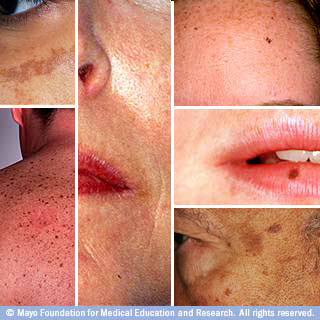 You may have heard people gush about their durability and resilience. So what is it? IPE (aka Ironwood) is one of the commercial names for a group of trees from the species Tabebuia. The trees typically grow from about 140-150 feet, but can reach heights of up to 200 feet. They can be found in Central and South America, but primarily grow in Brazil. IPE’s tough, resilent properties have given it increasing popularity in the decking and outdoor furniture world. Along with being incredibly durable, it’s also naturally resistant to decay, wet conditions, and infestation by termites and borers. Additionally, it has a Class A fire rating-the same rating given to concrete and setel. IPE’s heartwood is olive brown to black, and tends to feature striping. Its sapwood is much lighter, usually white or yellow.